We have all witnessed Prabhas's dedication for his work from Baahubali series, as the actor has solely focused on his characterization and film for years, without opting for any movies in the meantime. The Young Rebel Star is continuing the same for his next film Saaho. Saaho unit is busy shooting in RFC for an extensive schedule for 40 days, and since it involves crucial and intense scenes, Prabhas decided to stay in RFC to avoid unnecessary traveling daily to his house, and is focusing on his role and work in the film. While his dedication is surprising the unit members, the team have sped up the shooting formalities. Saaho is one of the costliest films ever being made in Telugu, and the makers are spending a fortune for this action entertainer. 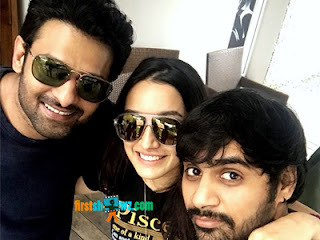 Bollywood actress Shraddha Kapoor is making her Tollywood debut with Saaho taking shape in the direction of Sujeeth. . Neil Nitin Mukesh, Arun Vijay, Jackie Shroff, Vennela Kishore, Mahesh Manjirekar, Mandira Bedi are other cast in the film.